Confession: I am a genuine world news junkie. I like sourcing my own media instead of just watching the eight o’clock news. Social media is an amazing outlet to do this. Enabling me to read an article from the New Yorker, followed by a media broadcast from Al Jazeera and to top it all up have a quick chat with one of my twitter friends from the Zaatari refugee camp in Jordan. And all that, accompanied by a cup of coffee. I love being able to select my own media sources and not be dependent on a few newspapers and broadcasters. It fits way better to the current ‘Global Citizen’s’ mindset doesn’t it? But even when you get your information from a variety of international sources. There is one thing that never changes. People love drama. The bad stories always tend to get more publicity than the good ones. For some reason, we have adopted the idea that good news isn’t news. If one of you has a valid explanation for that.. please share. Cause it is a mystery to me. But here is a news flash for you. 2015 is an amazing year for global development. Don’t worry.. I know that it is also a year with the biggest annual increase of refugees the world has ever seen. By the end of 2015, 59.5 million people were forcibly displaced. This is 8.3 million more than the previous year. And no.. these people are not all from Syria and Iraq. 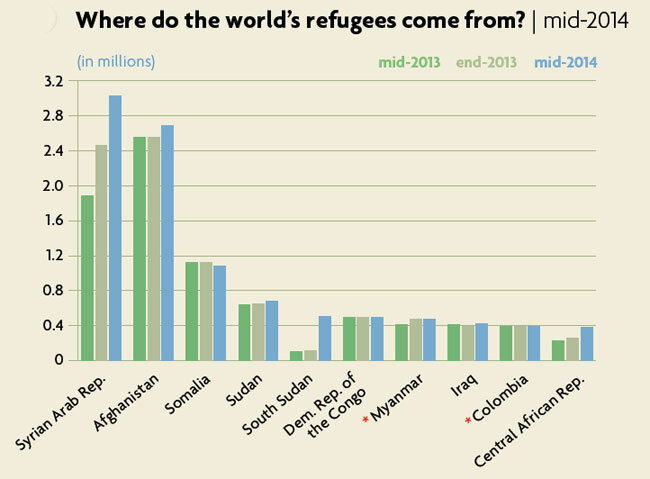 The majority is but to say all refugees are coming from one conflict. Nope.. not the case. But.. didn’t I say that 2015 was an amazing year for global development? Yes, I did. Here is why. Despite the fact that the world is facing humongous challenges it is also making a lot of progress on important development goals. 2015 is the end year of the Millennium Development Goals. And since the success stories of these goals don’t get the amount of visibility as big setbacks like..let’s say.. an epidemic.. it’s about time we start recognizing the progress made and even celebrate a bit. I am sure you have all heard of the Millennium Development Goals (MDGs). But for those who have forgotten about them over time. Let me dust them off. 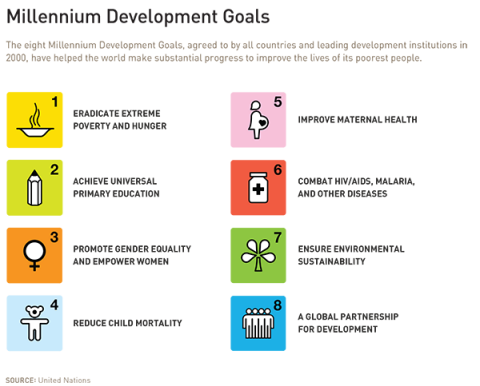 The MDGs were presented in the year 2000 to improve the lives of the world’s poorest people. They are supported by 189 nations and have a set deadline in (you guessed it) 2015. Just creating an initiative that has the support and dedication of so many countries is already a reason to applaud but it gets better. The nations that promised to work on these goals actually did. Now that is where it becomes great! Of course, the global community had formulated development goals before, but they never really worked. This time, they created measurable goals with specific results. I guess you can see it as a kind of report card for a country. And just like with a regular report card it makes development measurable and visual. Just imagine the vagueness of the word education. What does it mean to get educated? But when you chop the word up in certain skills it becomes a lot more concrete. At the end of each year, a report card will show how well a child has performed in math, English, writing, science etcetera. It shows in which areas the child is developing and on which areas the child might need some extra support. That is exactly what these Development Goals do to the vagueness of development. It shows in which areas a nation is making progress and on which it needs help. A very important result of a report card like this is that it has become visible, which developing countries are doing better in a specific area compared to other developing countries. This gives them the opportunity to work together and to re-use each others idea instead of all trying to invent the same solution. I know many of us still tend to see the developing world the way it is portrayed in those horrible UNICEF commercials of skinny children with flies in their eyes. Another result of our lust for drama. Unfortunately, organizations tend to think they will get more money by showing the horrors instead of the success stories. And maybe this is true.. I don’t know. But the fact is that the developing world is looking far more developed than most people think. Let me try to give you an idea as of why I am so happy about these MDGs. One of the goals was to cut extreme poverty in half by the end of 2015. Guess what. It reached its goal even before the deadline. Somewhere in 2010 the global rate of people living in extreme poverty, meaning on less than $1.25 a day, was reduced by half. Meaning that more than 1 billion people have been lifted out of extreme poverty since 1990 when nearly half of all people living in developing regions lived in extreme poverty. Now only 14% does. Of course, that is still a big number of people (around 800 million) but look at the progress. 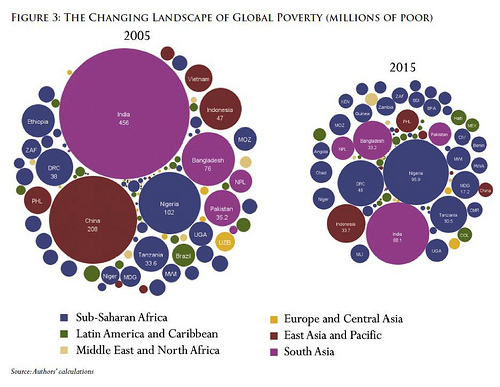 Image from ‘Poverty in Numbers: The Changing State of Global Poverty from 2005 to 2015’ by Laurence Chandy and Geoffrey Gertz. Full report. The same has happened to the amount of people lacking access to safe drinking water. Cut in half. And imagine this. The living conditions of more that 320 million people (2014) living in slums have been improved by providing them access to water sources, sanitation facilities, and better housing. Just to give you an idea of the size of that success story. The goal was to improve the living conditions of at least 100 million slum dweller. That would be the size of the population of the Philippines. Instead, more than three times the population of the Philippines has gained improved living conditions in only 15 years. Now if that is not worth a happy dance.. then I don’t know what is. But the story continues. The number of child deaths has declined from nearly 12 million in 1990 to 6.9 million in 2011…meaning 14.000 fewer child deaths per day. Ethiopia is one of the most successful countries in this particular story. They have successfully improved their healthcare system after finding a successful model which was being used in parts of India. Instead of reinventing a system they measured the success of existing systems and copied the best one. In Ethiopia alone child mortality has dropped over 60% since 1990. Creating a sort of ripple effect since Ethiopia is now the example system being used in Malawi, Rwanda and Nigeria (among others). Who would have thought that the number of success stories are almost too high for me to be able to fit them all in a blog that won’t exceed your concentration span.. I guess the world is not doing as bad as we thought. But let me give you just one more example. Just to wrap it all up and come back for a second to the example of a report card. I think we can all agree that education is one of the main components of reaching success when it comes to development. An educated child will become an educated adult. If there is one thing that creates the biggest ripple effect of them all.. It is education. And most of all.. Education for girls. I am still amazed when I hear stories of people who went on fancy safari’s and think that all children in Tanzania or Kenya are out of school. Forgetting the fact that they went on their holiday in summertime. Meaning that the children of their holiday destination were also enjoying their summer break. But let’s break some of those stereotypical views shall we. In the year 2000, 83% of all children in the developing regions were enrolled in primary school. Nowadays, in 2015, that number has increased to 91% of all children. If you imagine that the total enrollment in primary school in the developed world is 96%. Than the difference is not that big is it. Of course, many goals have not been reached and there is a lot to be done. But.. hey, that is what the Sustainable Development Goals are for. Kicking off on January 2016. So let’s look at things from the bright side. We aren’t doing half bad. Just consider what you can do to help those new goals to succeed. Donate monthly or annually to your favorite charity. Or simply ask around to see if someone in your community needs help or knows someone who does. Spend a few hours of your week doing something for someone else. It’s not that hard. And before the pessimists among you get the chance to state the obvious. No, we are not the only ones who are giving. The ‘poor’ are just as (if not more) generous than we are. But let’s not get lost in meaningless details and focus on the fact that the world development is our shared responsibility. So let’s do our part! 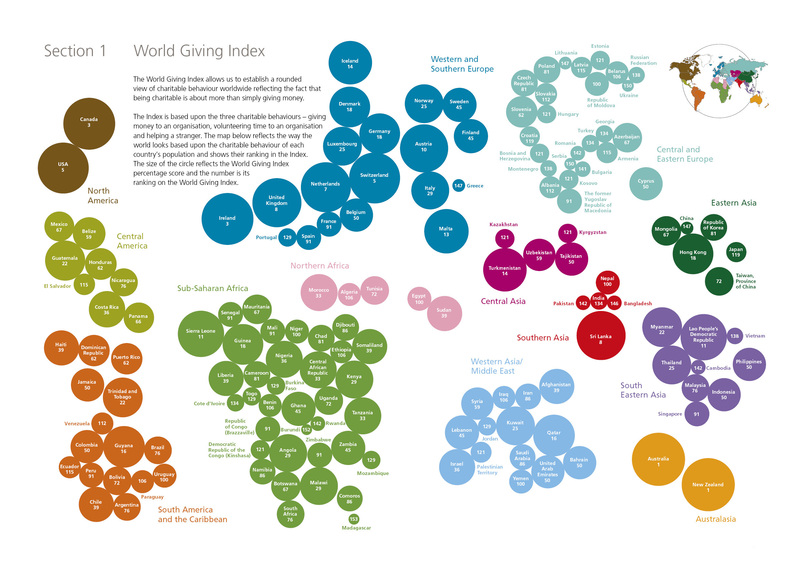 Image from ‘The World Giving Index 2010’ by Charities Aid Foundation (CAF). Full report.